After reading A Baby's Cry, this was a welcome return to the Cathy Glass I am used to (and it was better for it). Aimee is a difficult child (to put it mildly), but Cathy deals with her with kindness and calmness. Even when Aimee tries to play her mother off against Cathy and when she shoplifts, Cathy does not get cross, despite the hurt and disappointment she feels. 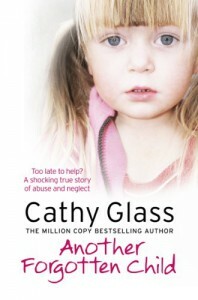 This is just one example of why Cathy Glass is such an inspirational foster carer, and the main reason I read her books. She gives me something to aspire to. Despite the fact that Aimee's mother is not a very nice woman for most of the book, Cathy Glass still manages to make us feel sympathetic towards her. I think that's something to be admired in a writer, even though this is a true story (especially since it's a true story, actually). There were a few typos, but nothing too bad. Not enough to merit a star loss, anyway. Cathy Glass often complains about the social care system in her books, but this was one of the books that made me truly angry at the system. Mistakes were made over and over and poor Aimee's suffering could have been totally avoided. Ugh. At least it had a happy ending, sort of. I wish her abusers had been brought to justice, though. A good return to form for Cathy Glass.